Language*: Catherine Bella MacFarlane spoke English. Biography*: The 1901 Census says that Cassie could both read and write in English, but not French. This census lists her date of birth as April 16, but the contemporaneous Church records are accepted. [S9] Births, Church Record, June 1977 to September 1944 St. Joseph's Church, Margaree, Records, page 62, line 18. [S5] Marriage, Church Record, November 1884 to September 1935 St. Joseph's Church, Margaree, Records, page 92, line 9. [S16] A. D. MacDonald, Mabou Pioneers, Volume I, page 680. [S500] Allan J. Gillis, "Descendants of Angus "The Miller" MacFarlane # 74," e-mail to Donald James MacFarlane, October 11, 2005, page 3. Language*: Margaret Matilda MacFarlane spoke English. Biography*: The 1901 Census says that Tillie could read in English, but not French. [S9] Births, Church Record, June 1977 to September 1944 St. Joseph's Church, Margaree, Records, page 30, line 4. [S861] Ancestry.com, online www.ancestry.com, 0861 - 1474b - John Archibald Gillis.docx. [S9] Births, Church Record, June 1977 to September 1944 St. Joseph's Church, Margaree, Records, page 34, line 15. [S861] Ancestry.com, online www.ancestry.com, 0861 - 1474d - John Archibald Gillis.docx. Name-Comm: His common name was Jim Moran. Birth*: Patrick was born circa 1900 in Jasper, Alberta, Canada. Birth*: Lucie was born circa 1875 in Nova Scotia, Canada. Death*: Lucie died circa 1935. 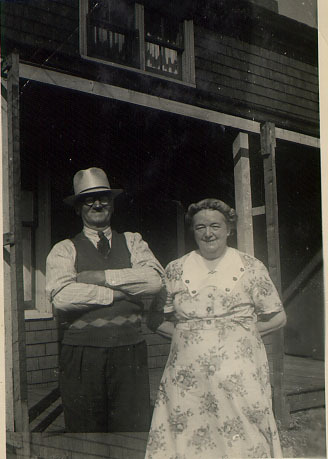 Birth*: Peter was born circa 1875 in Nova Scotia, Canada. 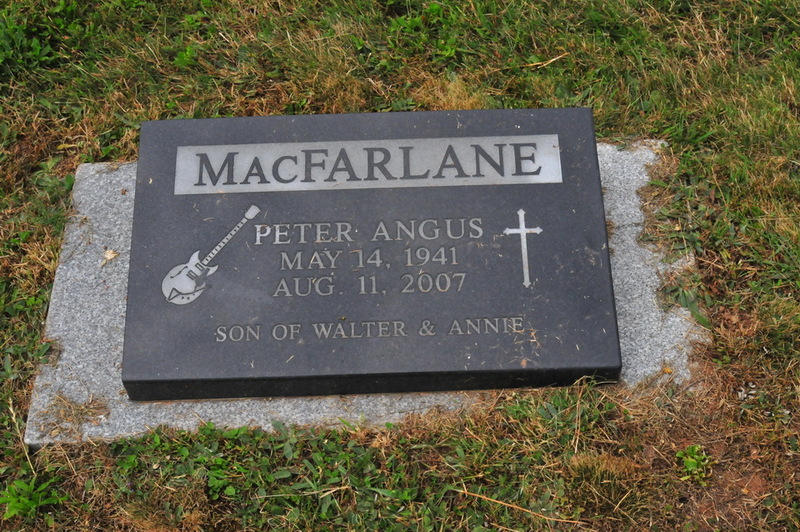 Married Name: As of 24 September 1935,her married name was MacFarlane. 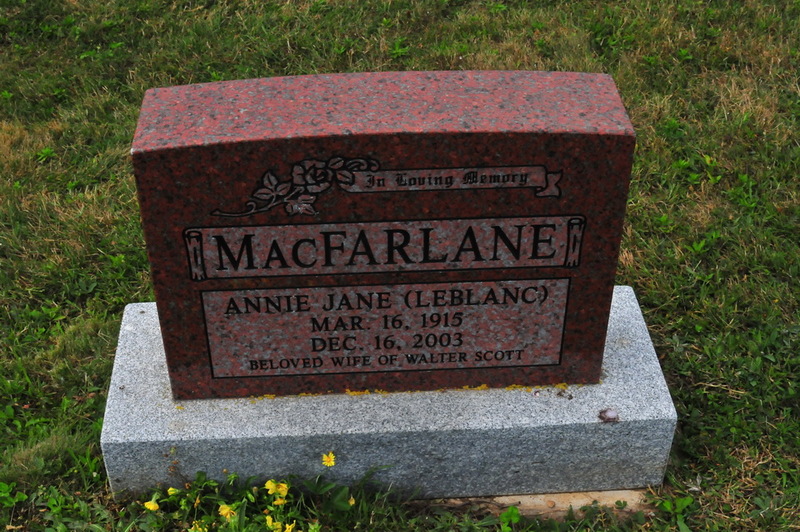 [S420] Obituaries from The Oran Newspaper, Obituary of Annie Jane MacFarlane, December 24 & 31, 2003. [S584] Obituaries - Selected Obituaries of People of NS, See original obit in source # 596. [S100] Obituaries from The Casket Newspaper, 1852 - present, Obituary of Annie Jane MacFarlane (LeBlanc), #1 December 2003. Married Name: As of 7 January 1858,her married name was MacDonnell. [S497] St. Michael's Parish Record, East Margaree, online www3.nf.sympatico.ca/trish.leblanc/stmichaels.html, page 25. [S497] St. Michael's Parish Record, East Margaree, online www3.nf.sympatico.ca/trish.leblanc/stmichaels.html, page 3. [S497] St. Michael's Parish Record, East Margaree, online www3.nf.sympatico.ca/trish.leblanc/stmichaels.html, page 4. Margaree Harbor, formerly South River. There died at Margaree Harbor on the 20th of Oct. 1892, John McFarlane, commonly known as John the Post. He was born at the South River of Antigonish in the year 1812, whence he moved with his parents to Margaree in 1826. When quite young, he was awarded the contract of carrying the mails, weekly on foot, from Mabou to Margaree Harbor, a distance of forty miles. He was a good walker and even when over seventy years of age, he would prefer going long distances on foot to troubling himself with a horse and wagon. How often we saw him passing by with a light step, a broad scotch bonnet on his head and a tartan plaid carefully folded around his graceful person! Biography*: "Moved to Margaree with his parents in 1826. When quite young he was awarded the contract of carrying the mails, weekly on foot, from Mabou to Margaree Harbor, a distance of forty miles. He was a good walker and even when over seventy years of age he would prefer going long distances on foot to troubling himself with a horse and wagon. How often we saw him passing by with a light step, a broad scotch bonnet on his head and a tartan plaid carefully folded around his graceful person! Though never a hard worker, he made his way through life honestly and decently and his cheerful, guileless ways, his amusing, harmless jokes, even his hearty laugh, secured for him hosts of friends where ever he moved." [S2] Letter, Edmund Burns to Gerald MacFarlane, December 1, 1991, pages 1, 3. [S476] Will of John MacFarlane # 86 Book A pages 198-199. [S2] Letter, Edmund Burns to Gerald MacFarlane, December 1, 1991, page 1, A-9. [S497] St. Michael's Parish Record, East Margaree, online www3.nf.sympatico.ca/trish.leblanc/stmichaels.html, pages 11, 15, 19. [S427] CBGHA, online www.cbgha.org, 1838-41 Cape Breton Census. Cheticamp. [S497] St. Michael's Parish Record, East Margaree, online www3.nf.sympatico.ca/trish.leblanc/stmichaels.html, Birth record of Marie McFarlane. Birth*: Nancy was born circa 1820 in Nova Scotia, Canada. [S2] Letter, Edmund Burns to Gerald MacFarlane, December 1, 1991, page 1, A-9-1.